It’s the height of the holiday season, and whether you’re staying at home soaking up some British sun or going a little further afield, you’ll inevitably be shaking up your beauty routine a little. It’s often hard to know what to expect of holiday weather until you’re there experiencing it, and when you do, you realise that you probably didn’t need all of those eyeshadows, highlighters and lipsticks. I’ll confess that I – not for the first time – came dangerously close to exceeding my baggage limit this summer due to all of the excess things I took along with me. Thinking about how I could streamline my make-up bag has made me think about holiday beauty more generally, and just how much I transform my usual routine to compensate for the change in temperature. It’s so important to stay hydrated when you’re on holiday, and I’m not just talking about drinking plenty of water (although that is essential). I’m talking about your skincare, as your skin will be inevitably battered by sun, sea and overindulgence in tasty things. Not only will your skin be dried out, making for a patchy tan, but your complexion will suffer, too. Take plenty of rehydrating products with you and apply them religiously, from when you first take off to your destination right through to when you arrive home again – and beyond. You’ll also find that you need less make-up if you’re feeling great about your skin. A brilliant new product is the Vichy Aqualia Thermal Masque, which works to intensively rehydrate the skin using hyaluronic acid and a special moisturising ingredient called AquabiorylTM. It’s a ‘once every few days’ sort of product, and it’s so effective that you really shouldn’t need to use it much more frequently than that. It promises to rehydrate the skin in just 10 minutes flat, and then eeps it feeling comfortable and soft for a whole 24 hours. Use this to alleviate the tightness of your skin when you get off the plane and then as often as needed during your holiday to maintain the softness. After sun exposure you’ll need something to soothe and calm the damage that the sun has caused. 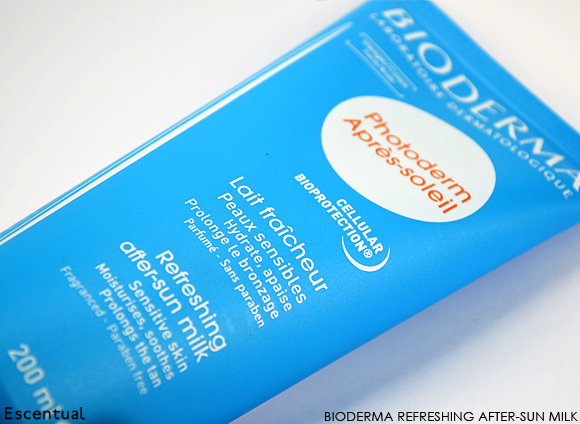 A new discovery for me is the Bioderma Photoderm After Sun Milk, which feels amazing after a day in the sun. It’s light and silky, which is exactly what sun-sore skin needs, and its formula contains emollient moisturisers plus a cell protection complex to curb peeling and excessive dryness. And that’s not even mentioning its scent, which is an addictive blend of citrus, apple and almonds. Just lovely. In the heat you may be sweating (sorry – glowing) and feeling generally pretty uncomfortable, so you should keep your base as light as possible. Best case scenario, you don’t use a make-up base at all. Nevertheless, I know that imperfections and pigmentation can often get many people down, and wearing a little something can make you feel much better. There is an alternative which gives you some coverage and all of the sun protection that you need: tinted sun screen. To get the correct level of protection from your sun cream, the trick is to slather it on with a heavy hand. It’s near impossible to do this with a foundation that contains SPF and get a natural-looking result. Plus they often don’t have broad spectrum UVA and UVB defence, which offers all-around protection from burning and cell damage. Therefore it’s best to stick to a tinted sun screen when you know that the sun will be quite strong. These formulas have become more sophisticated in recent years; they give you all of the benefits of highly productive, stable sun protection with the added benefit of natural-looking colour pigments. 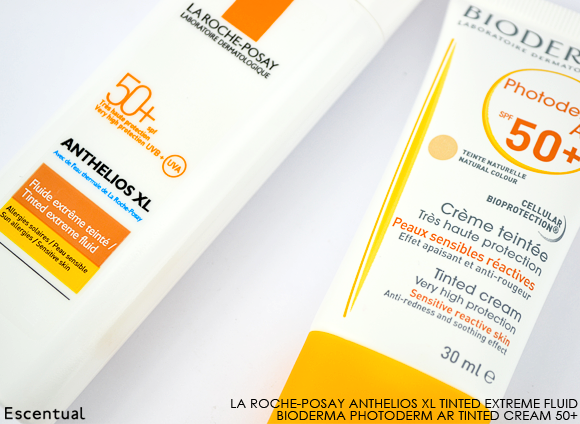 I have tried and tested two brilliant formulas: the silky La Roche-Posay Anthelios XL SPF50+ Tinted Fluid for my combination skin at the beginning of the summer, and the nourishing Bioderma Photoderm AR Tinted Cream, which is excellent for when my skin is feeling dried out and irritated by the sun from the mid-section to the end of summer. As the tint is relatively sheer for both products, you can slather on as much product as is needed for adequate protection, and then blend out on the neck. They give a lovely luminous finish, particularly the Bioderma cream, which is as comfortable to wear as a regular foundation or BB cream. My favourite thing about tinted sun protection is that it offers just enough coverage to combat redness and unevenness, while letting me show off my freckles for a change! During the summer months, I tend to wear mostly creams and liquids on my cheeks – and very sparingly at that. I find that they wear away during the day more evenly than powders, and they give a lovely sheer finish. My favourite cheek colours for summer are the Daniel Sandler Watercolour Creme Bronzer in Riviera and the Stila Convertible Cheek Colour in Petunia. The former helps me to perfectly control my contouring to create a beautifully natural glow, while the fresh coral pink of Petunia applies and blends with a feather-light touch and lasts very well indeed. A brilliant thing about both formulas is that you can use your fingers and also double them up as lip colours, making for a less bulky holiday make-up bag! For lips, try something moisturising as well at tinted. It’s surprising just how dry your lips get after lengthy exposure to the sun, and you only notice once they start to become quite cracked and sore. There’s no reason to forgo the glamour, though – try a tinted formula like the Dior Addict Glow Colour Awakening Lip Balm, a genius balm that reacts to the pH of your lips to create a customised tint. Infused with wild mango and luffa cylindric, the buttery balm is cushiony soft and also contains SPF10. 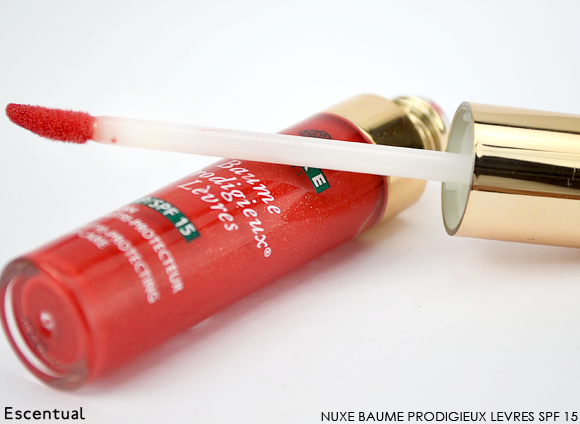 If you’d prefer something a little more pigmented, the Nuxe Baume Prodigieux Multi-Protecting Lip Care hybrid balm-gloss has an SPF of 15, plumps the lips and drenches patched skin with vitamin E, shea, sweet almond oil and mango moisture. Oh, and it’s available in 3 gorgeous shades, including a gorgeous pillarbox red, and smells of cake. There are plenty of waterproof, foolproof products available to add a touch of colour to the eyes without the need for constant touch ups. 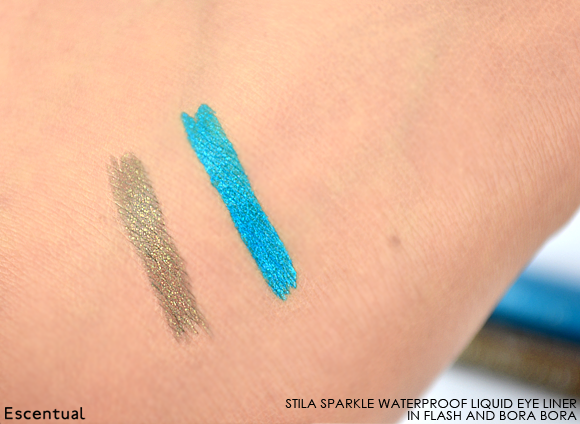 One of my favourites is the Stila Sparkle Waterproof Liquid Eye Liner, which provides bright colour, ultra long-lasting wear and some gorgeous sparkle in one sweep of its tapered wand. It’s such an easy formula to work with and it’s available in an array of really pretty shades. My favourites are Bora Bora, a cool Mediterranean blue and Flash, a burnished gold. For those happy with just a slick of mascara, there are several waterproof choices from you to choose from. bareMinerals Flawless Definition Waterproof Mascara is ideal for those with naturally lush lashes, or those who prefer subtle definition. For a bit more ‘oomph’, try the big and bold Too Faced Lash Injection Mascara for oversized lashes. Summer fragrances are generally of the light, fun and carefree variety, specifically created for the brightest time of year. For me, their cheerfulness makes them almost impossible not to love! On a practical level, these scents are particularly easy to wear because the heat of a summer’s day requires a lighter touch of fragrance. 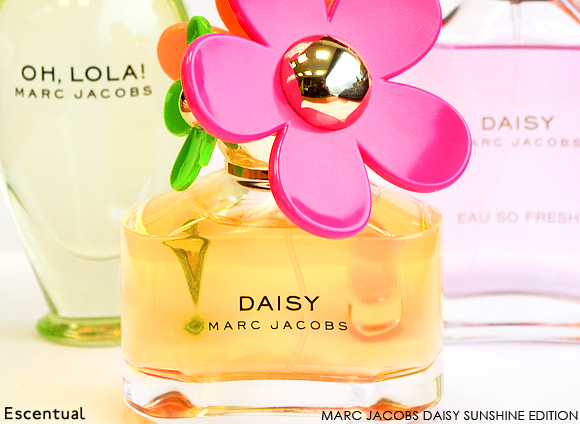 My top summer fragrance picks are typically cocktail-like affairs – it’s that time of year when you can break out of your more respectable perfume box and be a little silly, after all – the Escada Cherry in the Air Eau de Toilette, and the Marc Jacobs Daisy Sunshine Edition Eau de Toilette. These two scents are brimming with confidence and have such a sunny disposition. Where Cherry in the Air blends cherry, marshmallow and coconut orchid for a more gourmand approach to the summer scent, Daisy Sunshine delights in tropical blasts of guava, juicy mandarin and lychee. 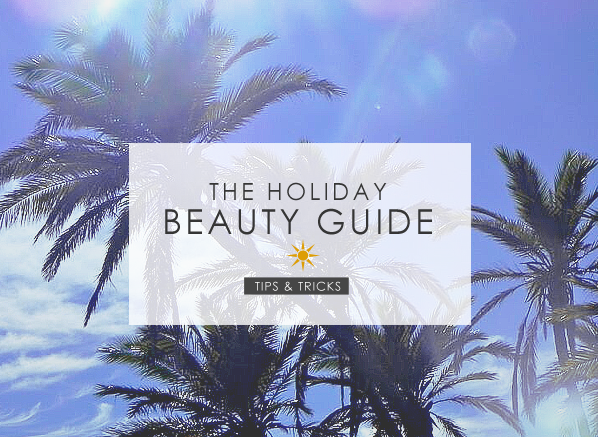 So, there’s my guide to all things holiday beauty – let me know about your can’t-live-withouts and summer saviours below! This entry was posted on Thursday, July 11th, 2013 at 10:15 am and is filed under Hints & Tips, Make-up, Skincare, Sun and Tanning. You can follow any responses to this entry through the RSS 2.0 feed. You can skip to the end and leave a response. Pinging is currently not allowed.